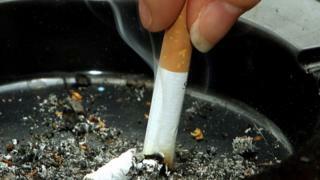 Smoking rates in England have fallen to the lowest on record, Public Health England (PHE) has said. In 2015, 16.9% of adults described themselves as smokers, compared with 19.3% in 2012. Out of the 2.5 million smokers who tried to kick the habit, a fifth were successful. According to Public Health England, this is the highest recorded successful quitting rate to date - six years ago the success rate was around one in seven. The biggest decreases in smoking over the last four years were seen in the South West (18.7% to 15.5%), the North East (22% to 18.7%) and Yorkshire & Humber (21.9% to 18.6%). At the same time, prescriptions for smoking cessation aids, such as patches and gum have gone down, while sales of e-cigarettes have gone up. Despite the fall, there are wide variations across the country and a north-south divide. Kingston-upon-Hull has the highest rate of smoking with almost 27 in every 100 adults. And Wokingham has the lowest, with fewer than one in 10. Overall, the smoking rate among women was 14.9%, while in men it was 19.1%. In 2014/15, the number of prescription items dispensed in England to help people stop smoking was 1.3 million, compared to two million 10 years ago. Health professionals say the most effective way to quit smoking remains through prescription medication and professional support from free local NHS stop smoking services. Rosanna O'Connor, director of drugs, alcohol, tobacco at Public Health England, said: "The reduction in smoking rates isn't the result of a single magic bullet but concerted policies over decades." Deputy Chief Medical Officer Dr Gina Radford said: "The best thing a smoker can do for their health is to stop smoking. There is more help and support available now than ever before." PHE released the figures ahead of its Stoptober campaign, which aims to encourage smokers to quit smoking during October. According to experts, taking a complete break from cigarettes for at least 28 days greatly increases the odds of being able to kick the smoking habit for life. Latest data (for 2014) shows that 20% of adults in Scotland are current smokers. In Wales the figure is 19% and in Northern Ireland it is 18%.